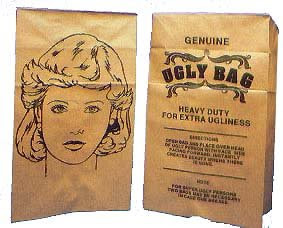 Good news for all of you guys with ugly girlfriends: You can now order Ugly Bags (see picture) in bulk. Simply put over your girlfriend's head and instant attraction. (If you like that 1970s Charlies Angels look) Or keep a stash at your place, doubling the amount of girls you might find acceptable to bring home to...um...meet your parents. Attention Female FEIGNs (Friends of EIGN): dcgrrl18 pointed out that you can find the male version of the UGLY BAG here. So now we can eliminate ugly boyfriends or boy-toys too. Please note: Two bags are recommended for Xtra ugly. Gifting ugly bags is not recommended. Sweet. I wanted, but forgot, to look for the male version. Sorry female FEIGNs. I wish I had found this years ago, my life would probably be a whole lot different right now. Readers, it is okay to gift these to me; keep this in mind as a birthday present. But hopefully you'll think I'll only need ONE.